What's the long and short of it? 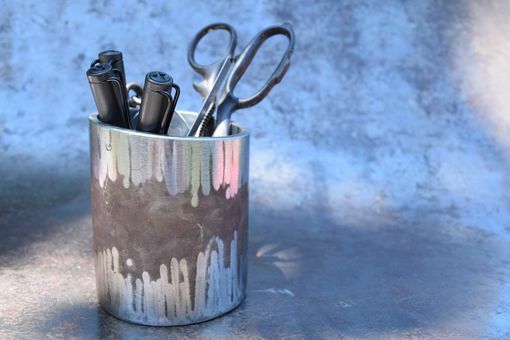 This listing is for one Hyde desk organizer that will be handmade to order. 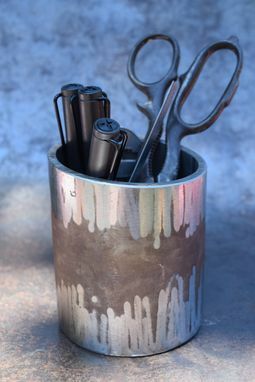 The Hyde is a simple industrial desk organizer with a unique finish inspired by buffalo hides and digital sound files. 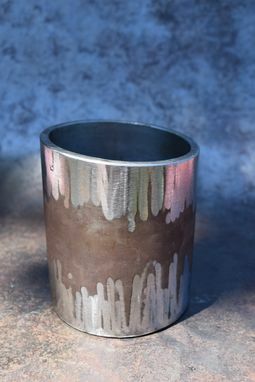 After a special patina is applied to the steel, the outer portions of the Hyde's exterior are hand ground, leaving a one-of-a-kind belt around the container. As with the other desk organizers from the Big Purple Barn, the Hyde's base is fully welded and the whole affair is quite weighty. The extra heft offered by the steel makes it difficult to knock the Big Purple Barn's desk organizers over, even when they're full! The Hyde can be purchased with a thick rubber liner that rests in the base of the container to help protect your container and your office supplies. 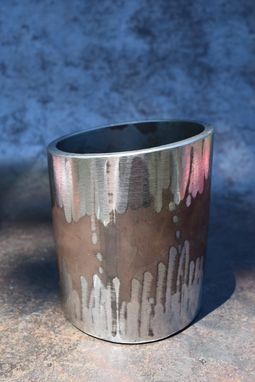 Like the Hyde but want a fully ground or fully patinated finish? Just let me know in your Note To The Seller when you order! Sale does not include pens, scissors, or a beer can. Sorry folks, just the dish.